The 10 foot x 10 foot Goliath Heavy-Duty All-Aluminum Instant Canopy in White is definitely the shelter for people looking for maximum function and superior toughness. Although the unexpected can always happen when you spend enough time outdoors, this durable shelter is about as close as you can come to taking out an insurance policy against the worst that Mother Nature has to offer. First of all, this 10' x 10' shelter features a rust-free aluminum frame with 2-inch diameter legs for maximum support. From the extended trusses to the solid peak, every bit of this frame is designed for strength, durability, and structure in every situation. All that, and did we mention 'rust-free'? That's something you don't see in the description of too many commercial canopies on the market. The rest of the package is pretty tough, too. The top is made of 500-denier polyester with a PVC backing, which blocks up to 95% of UV rays for your long-term protection from sun damage. It's water, mildew, and flame-resistant in case the unexpected suddenly happens (as it tends to do). To top it all off, you'll also receive four spikes and rope to secure the canopy in place, plus a heavy-duty roller bag to get it to and from wherever you're planning to use it. To make a long story short, this is about as heavy-duty as outdoor shelters get - hence the name. But it isn't bulky, incredibly heavy, or difficult to manage. What you get is a solid structure built to last and last that you can take with you on all sorts of outdoor adventures. Try out the 10' x 10' Goliath Heavy-Duty All-Aluminum Instant Canopy in White if you're interested in years of stable, reliable function in almost any setting or conditions. 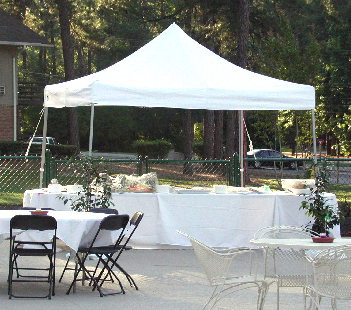 Every once in a while you may need a little added weight to make sure an extra-stiff breeze doesn't threaten to cut your day underneath your King Canopy instant canopy short. This set of 4 handy Wrap-A-Round weight bags are more than up to the task.